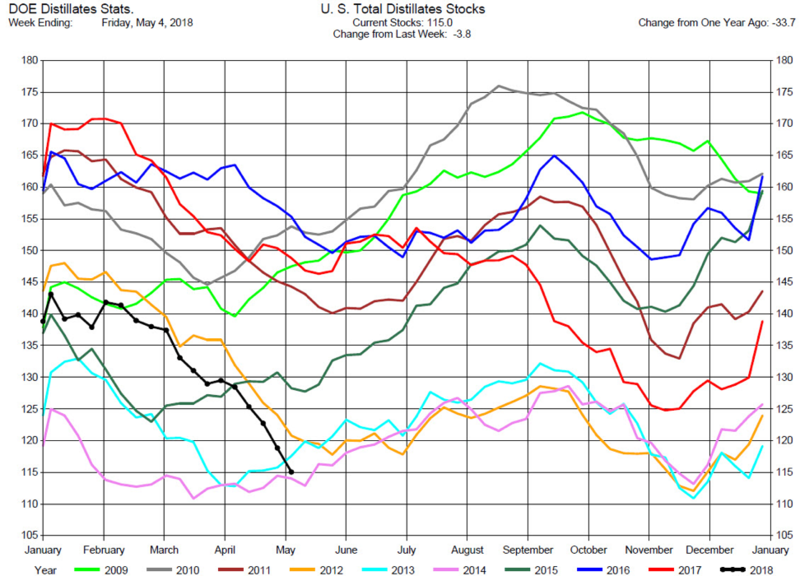 The weekly Department of Energy release for the week ending May 4 reported Total Distillates Stocks dropping to historically low levels. 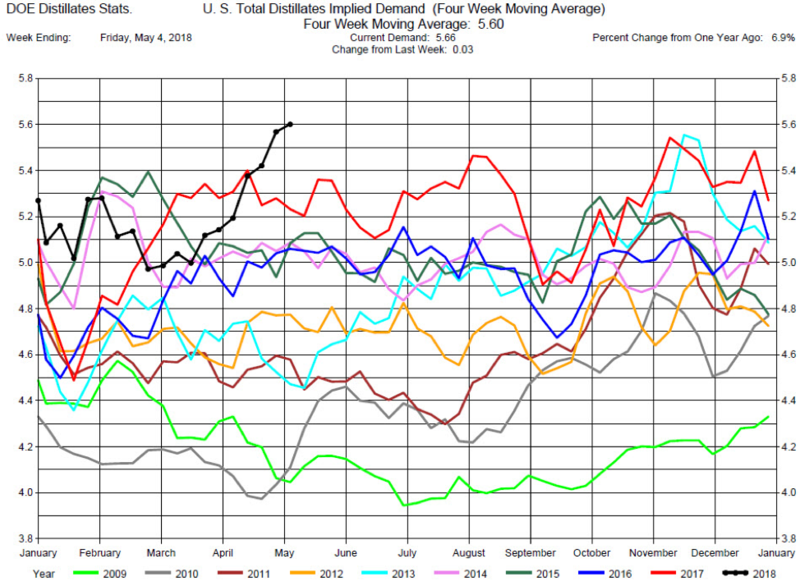 At the same time, Total Distillates Implied Demand reaches historic highs, see charts below. For Fundamental Analytics’ coverage of the DOE release, click on this link. 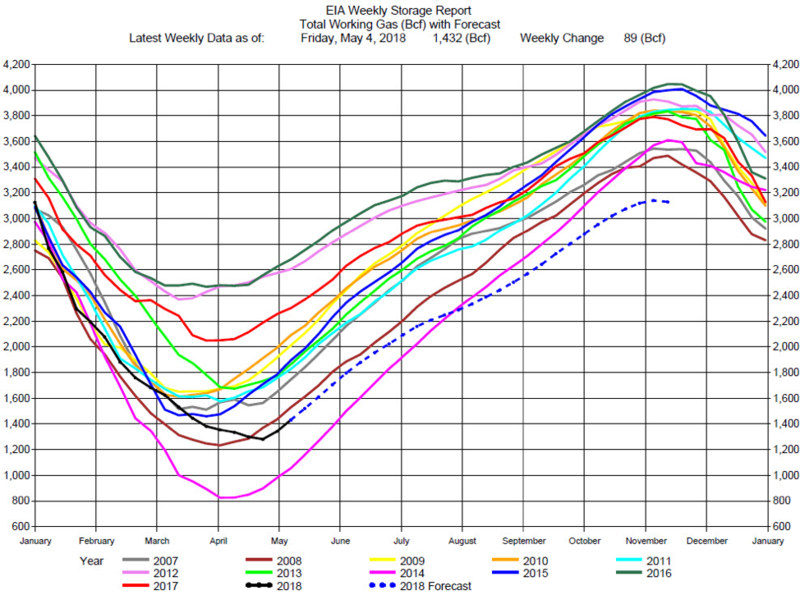 The EIA Weekly Storage Report for the week ending May 4 had an 89 bcf injection, lower than expectation, remaining at historically low storage levels of Natural Gas – comparatively lower only in 2014. Projections for the rest of the Injection Season have historical lows continuing, as the chart below shows. For an analysis of the EIA report, click on this link. The May USDA WASDE Report on Thursday indicated that US Soybean supplies should fall in the upcoming marketing year due to high domestic demand and strong exports. Soybean futures jumped 1 percent after the report was released. The USDA estimated Soybeans ending stocks at 415 million bushels, far below its forecast for 2017/18 of 530 million bushels. 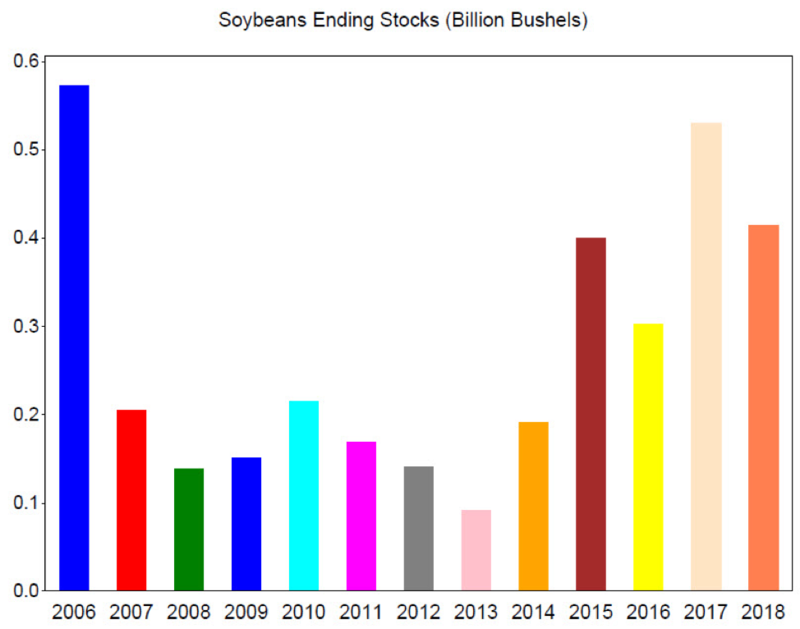 The chart below shows Soybean ending stocks back to 2006. 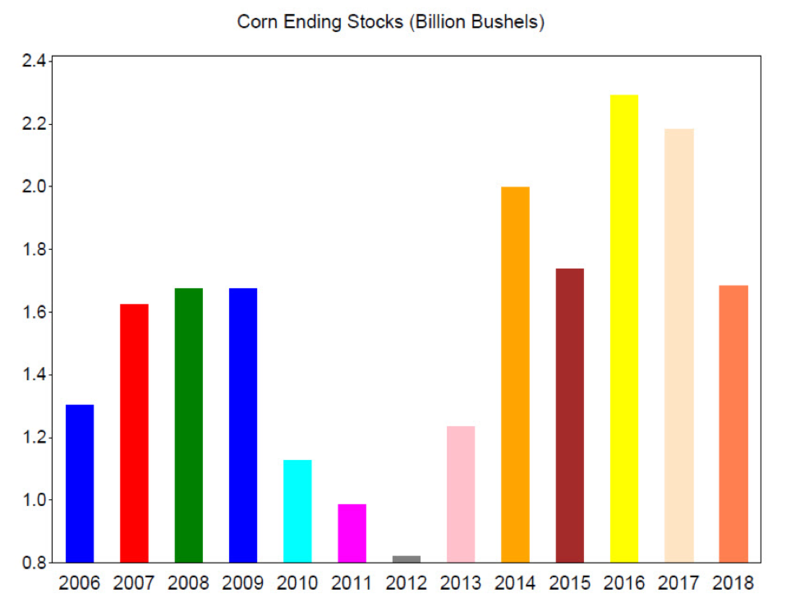 Ending stocks for Corn were in line with market forecasts at 1.682 billion bushels for 2018/19. The Corn harvest was forecast at 14.040 billion bushels in 2018/19, down from 14.604 billion bushels in 2017/18. 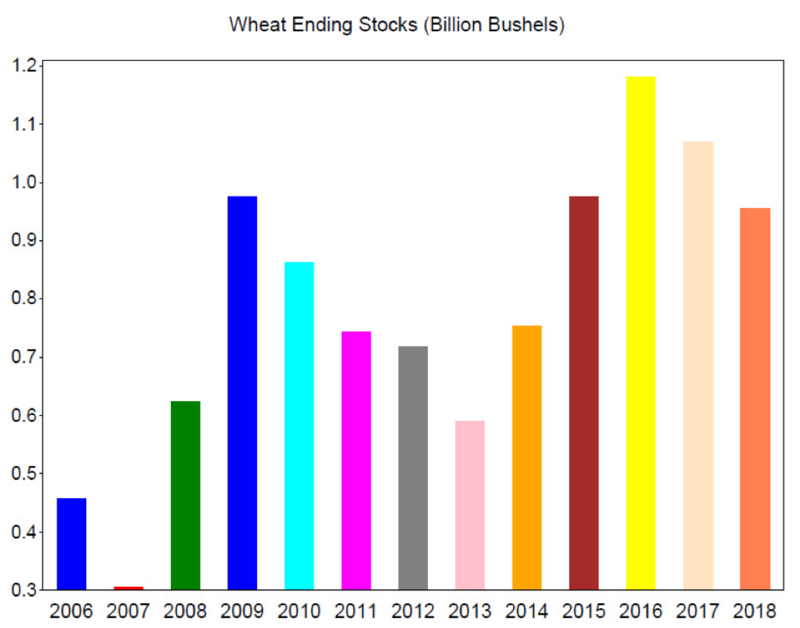 Wheat ending stocks were above market expectations with ending stocks at 955 million bushels for 2018/19.